Part 7, “Hearts of Darkness,” focused on the rise of two of the most notorious figures in the 20th century. While Hitler’s and Mussolini’s regimes differed in the speed with which each achieved total power, the two leaders had exuded similar messianic pretensions for years. Once in firm control, these counterfeit christs willingly accepted the divinity their adoring publics granted them. What had taken Benito Mussolini three years in Italy took Adolf Hitler a mere three months in Germany. The Führer’s brutal regime seemed to arrive almost fully developed early in 1933. Historian Fritz Stern writes, “In ninety days, a one-party state had been established and people had been stripped of rights that in the Western world had been thought inalienable for centuries.” The Duce, on the other hand, had only gradually achieved his totalitarian state. Mussolini was invited to become prime minister in 1922. Leveraging an already existing Italian appetite for political religion in which the fatherland was considered divine, he embarked on the fantasy that his governmental system could solve all of Italy’s postwar problems. His intended solution was centered on institutionalizing a fascist religion. Between 1925 and 1939, four party secretaries worked in succession to introduce the new quasi-religious order to a mostly willing Italian populace, with the goal of establishing the “New Man” of fascism. Though Italian fascism did not begin with the cult of Mussolini, he had previously been accorded mythic stature as a socialist and wartime interventionist leader. His elevation to divinity came later, after 1925, as the new movement tightened its grip on Italy. Once the religion of fascism was securely installed, Mussolini could claim to be the center of its worship. 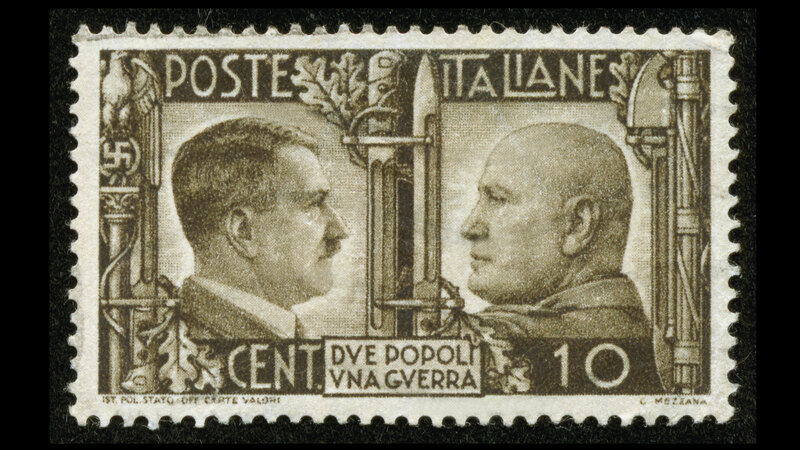 Gentile refers to Il Duce’s form of rule as “totalitarian caesarism.” As we have seen in this series, religious sentiments were manipulated by many of the Caesars, several of whom were deified. Some even demanded divinity while still alive. It comes as no surprise, then, that according to this same historian, the cult of the Leader made Mussolini the equivalent of the greatest emperors, Caesar and Augustus. Scholar Piero Melograni notes that Mussolini came to believe the hype himself and “claimed to be the heir, if not the actual reincarnation, of Augustus” (“The Cult of the Duce in Mussolini’s Italy,” Journal of Contemporary History, 1976). As indicated, the major promoter of this adulation was Starace. He formalized the cult, even instructing that the word Duce always appear in capital letters. Following his appointment, attempts to impose institutionalized fascist religion on the general public knew no bounds. The fawning journalist Asvero Gravelli composed some extraordinarily effusive lines about the Leader, including, “God and history today mean Mussolini.” It was not, however, fascism per se or its other leaders that inspired so many Italian people. Thus when Gentile quotes an anonymous informer (“Fascism is a religion, a religion that has found its God”), he means to emphasize the Duce’s central role in fascism’s appeal. It was the person of Mussolini himself that drew people, not “belief in the values and dogmas of the Fascist religion.” Gentile adds the important thought that it was in part traditional Italian religious faith that made adulation of Mussolini so easily possible. To the north, in Germany, a similar melding of religious fervor, idolatry and political purpose was accelerated once Hitler came to office. Asked by President Paul von Hindenburg to become chancellor at the end of January 1933, the Führer moved quickly to establish authoritarian control. Yet, in parallel with extreme brutality toward any opposition, he continued to assert that traditional values and legal means were central to his actions. Historian Ian Kershaw notes that “once he had become Chancellor, Hitler’s language became pronouncedly ‘messianic’ in tone, and his public addresses were frequently replete with religious symbolism.” Themes of renewal and mission merged religious concepts with the Führer’s political purposes. In his first radio address as chancellor, he acknowledged Christianity “as the basis of our entire morality” and the family “as the germ of our body of nation and state,” and he ended with an appeal he would often use, asking “the Almighty” to bless the government. Despite his apparent religiosity, Hitler’s faith was quite different from that of the churches. But the atheistic side of Nazi philosophy was somehow successfully separated from his professed personal beliefs. Thus for a long time he managed to deceive the public and many church leaders into believing that Nazi actions against Christians were simply the excesses of some of his followers. Hitler had, of course, recognized that it would be premature to attack the Catholic and Protestant churches openly. His first goal was the destruction of the Jews, and only then what he called “the rotten branch of Christianity.” For the time being he needed church support among the population and aimed at controlling political Catholicism within the state. Thus in July 1933, like Mussolini before him, he disingenuously entered a concordat with the Vatican. Quieting party opponents of the agreement, he privately told them that he needed to create “an atmosphere of harmony in religious matters.” Accordingly, he worked at convincing many leading church figures that he was a sincere Christian believer. As late as 1936, Cardinal Faulhaber, archbishop of Munich, wrote in a private memo, “The Reich Chancellor undoubtedly lives in belief in God.” With the Protestant churches, Hitler was less successful, though even many of their leaders were willing to encourage support for him among their members. Hitler’s personal beliefs were a strange amalgam. Baptized and raised a Catholic, he had apparently adopted aspects of pagan Nordic religion and distortions of biblical belief. According to Vatican scholar Peter Godman, he “saw himself as a redeemer . . . [and] claimed that his movement had discovered the true meaning of the New Testament. The Old Testament was to be excluded because it was ‘Semitic’; God’s law was to be identified with racism. Hitler portrayed himself as the prophet of this doctrine, which [he said] the Catholic Church had perverted.” Hitler’s idea was that the Aryan/Nordic race was superior. He said that the New Testament was wrong about Jesus, asserting that he was not a Jew but actually of Nordic blood. The opportunity for Hitler to bring about dictatorial rule came very soon after his taking office. And it came by chance in the wake of an attempt to burn down the Reichstag in late February 1933. Perpetrated by either a Bulgarian communist or a mentally unstable Dutchman with communist connections—historians still cannot agree—the arson was reason enough for Hindenburg to agree with the chancellor that the nation was now in grave danger from bolshevism. As a result, the president immediately signed emergency decrees suspending fundamental civic rights. Arrest of “suspects” without formal charge or access to legal counsel was now possible. Though largely unrecognized at the time, this “democratic” presidential action formed the legal basis of all the terror that descended on the inhabitants of German-controlled territory in the Nazi period. But Hitler went further. Lacking a parliamentary majority, he asked the Reichstag for the power to rule by decree. Astonishingly, the parties agreed (with one exception, the Social Democrats), thereby relinquishing power to the presently cooperative chancellor, who was now on the fast track to becoming the all-powerful Führer. By March, the authorities had arrested 10,000 people in Bavaria—communists, socialists and democrats—and opened the first concentration camp on the outskirts of Munich at Dachau. By April, Prussian police had rounded up a further 25,000. The abolition of trade unions and the disappearance of all other political parties, voluntarily or by force, followed within Hitler’s first six months in office. In June 1934, the long-awaited face-to-face between Hitler and Mussolini—one of 17 such meetings—took place in Venice. It was the first time Hitler had ventured outside Germany as leader. He had admired the Duce for years, emulating him and even keeping a life-sized bust of his hero in his personal quarters at Munich’s Nazi headquarters, the Braun Haus. From Hitler’s point of view, Germany was Italy’s natural ally, counterbalancing Italy’s natural enemy, France. But the meeting at a Venetian palace once owned by Napoleon disappointed both parties for personal reasons. Hitler objected to the city’s decadent art and its all-too-prevalent mosquitoes, while Mussolini was bored with the Führer’s one-way bombastic conversations. More significantly, the visit presaged the gradual sea change in their relationship. From now on Hitler would no longer be in the subordinate position. Over the next decade, this shift would contribute heavily to the Duce’s downfall. Two separate events soon assured Hitler’s complete control of Germany. On his return from Venice, he orchestrated the “Night of the Long Knives.” Moving ruthlessly against challengers within his own party, he ordered the murder of the leadership of the SA (Sturm Abteilung, or Storm Troopers), including his former Munich compatriot, Ernst Röhm. The execution of two German army generals and a number of Jews came next. Heinrich Himmler’s SS (Schutzstaffeln, or Protection Squad) carried out the entire purge. For his timely action in heading off what was presented as yet another “threat” to the nation, Hitler received official thanks from Hindenburg, though there is doubt that the president personally sent the message. The second event was the death in August of the ailing president himself. A hastily introduced law had combined Hindenburg’s role with Hitler’s, making the cold-blooded chancellor supreme commander of the armed forces on the veteran leader’s demise. Once the representative of the old guard was no longer there to impede Hitler’s ambitions, the army confirmed his dictatorship by an oath of loyalty, despite the Führer’s recent purge of two of its own. By March 1936, the Führer seemed to have become convinced that he was in some kind of mystical relationship not only with the people but also with God. He had just succeeded in restoring the Rhineland to Germany by exploiting French weakness and British passivity and simply marching his troops into the demilitarized area. Feelings of infallibility began to overwhelm him. Speaking that month to a large crowd in Munich, he said, “I go with the certainty of a sleepwalker along the path laid out for me by Providence.” Pseudo-religious terms began to dominate his speech. Down south, similar ambitions had long preoccupied the Duce. Mussolini had mulled over the idea of renewing the Roman Empire for many years. Ethiopia, sandwiched between the two Italian colonies of Eritrea and Somaliland at the Horn of Africa, represented an opportunity. At the end of 1934, he wrote that force was now necessary to resolve a diplomatic impasse. A year later, Italian forces defeated the pathetically armed Ethiopians, bombing them with poison gas. Now the Duce could grandiosely declare that “Italy finally has its empire. . . . It is a Fascist empire, an empire of peace, an empire of civilization and humanity.” Hardly. Soon the newly established colonies in Africa Orientale Italiana (AOI) were overcome by waste, corruption and inefficiency, their distance from the fatherland a constant challenge. In November 1936, Mussolini coined the term by which the allies in World War II came to know their fascist enemies. Speaking in Milan, he said that the relationship between Italy and Germany was “an axis around which all European states, animated by a desire for collaboration and peace, can revolve.” Mussolini had in mind that he and Hitler would divide continental Europe between them. The Nazis had proposed that he visit Germany, and he hoped that his stay would “signal not just the solidarity between the two regimes but also [the adoption of] a common policy by the two states which must be clearly delineated towards East and West, South and North.” By this he apparently meant that Italy would take care of the Mediterranean Basin, and Germany would concentrate on Eastern Europe and the Baltic. In late September, Mussolini made his first official visit to Germany. Bosworth records that before an audience of 800,000 in Berlin, the Duce proclaimed fascism and Nazism as “the greatest and most authentic democracies existing in the present day world.” Doubling up on this contradiction, on his return home he began to wonder about incorporating racism into his political platform. It was an idea that would grow in the months ahead as Hitler’s reputation for decisive action began to eclipse Mussolini’s status as first leader of fascism. When Hitler invaded Austria in March 1938 and forced its union with Germany, Italy’s acceptance of the aggression brought the Duce into disrepute with some of his own people. Some scholars believe that this act marked the end of Italian independence from Hitler. Anxious to shore up his role within the state, Mussolini had himself declared “First Marshal of the Empire,” replacing the king as sole authority over the armed forces in wartime. But when the Führer came to visit Italy a second time in May, protocol required that the king (as head of state) and not the prime minister ride with him. This contributed to the growing public perception of Mussolini as Hitler’s second man. Fascism’s original voice was fast becoming the lesser partner. Realizing the shift and desperate to keep pace with Nazi policies, the Duce now introduced various racial policies, with special reference to the Jews. Declaring true Italians to be of Aryan stock, Mussolini aligned himself with virulent anti-Semitism, though he had previously called it Nazi “anti-scientific drivel.” It was an example of naked expedience with horrific consequences. Italians saw fellow countrymen and women of Jewish and other “non-Aryan” origins prevented from marrying Italian “Aryans”; in 1943 more than 8,500 Jews were deported from Italian territory to death camps in Austria. In February 1939, Italy and Germany signed a new commercial agreement, a clause of which provided for 500,000 Italian guest workers to help out in German industry. The slough of alignment was deepening. In May came the military alliance known as the “Pact of Steel.” But Mussolini, aware that war in Europe was inevitable, opposed an immediate declaration. He would have liked to postpone it until 1942 to give Italy time to shore up its woefully inadequate armed forces. Meeting Hitler at the Brenner border with Germany in March 1940, the Duce could make no commitment to war. Yet in June, sensing an opportunity to share in the spoils and gain French territory on the Italian border, he gave halting military support to Hitler’s already successful invasion of France. However, fruitless military adventures in Greece later that year set the Duce on a downward path that saw him driven from Rome in 1944 as the allies moved northward from their invasion of Sicily, and he was stripped of his office by the king. In his Berlin bunker amid bombs and fire, Hitler heard of the Duce’s death. Two days later, alternating between despair and hope that his troops would yet break through the Russian advance and save him, he planned his final destructive act. With the blood of six million on his hands, and caring nothing about the ongoing suffering of the German people, the most hated figure in human history made ready for suicide. The parallels between Mussolini and Hitler were many: elements of their childhoods, World War I experiences, disillusion with postwar conditions in their homelands, rightist politics, anticommunist persuasions, brutality, delusions of grandeur. Certainly, as the Führer admitted, Mussolini inspired him, having come to power a decade earlier. But eventually Mussolini, to his chagrin, was eclipsed by his admirer. Perhaps the most telling similarity was the enormous pride with which each pursued his path. Kershaw subtitled the first volume of his biography of Hitler Hubris. He named the sequel after the Greek god of retribution, Nemesis, for the inevitable consequence of gargantuan pride. The same words surely describe Mussolini’s life story. Both Mussolini and Hitler made vain and failed attempts at the same kind of universal human messiahship we have examined across millennia. At the human level it can never be. Next time, we look at the lessons we might learn from these thousands of years of failed messiahs. Ian Kershaw, Hitler, 1889–1936: Hubris (1998). Ian Kershaw, Hitler, 1936–1945: Nemesis (2000). Ian Kershaw, The “Hitler Myth”: Image and Reality in the Third Reich (1987). Fritz Stern, Five Germanys I Have Known (2006). David Welch, The Third Reich: Politics and Propaganda (1993). The Downfall: Hitler and the End of the Third Reich, directed by Oliver Hirschbiegel (2004). Triumph of the Will, written and directed by Leni Riefenstahl (1935).